Dan Mullen has done a good job of upgrading Florida’s recruiting immediately. The 2014 class was the last one prior to his arrival to finish in the top ten of the 247Sports Composite rankings. More crucially, the 2013 class was the last one to have more than half of its composition consist of blue chip 4-star and 5-star recruits. Jim McElwain’s final 2017 class came close, finishing No. 10 on signing day before later dropping a spot to 11th and having 11 blue chips to 12 non-blue chips. Even then, two of the top ’17 recruits never played with James Robinson getting a medical disqualification for a heart condition and Kadeem Telfort participating in the credit card fraud scheme before transferring. Mullen’s small transitional class had 65% blue chip players, and the class he just finished this year is ranked No. 9 with 68% blue chips. He’s not quite back to the heights that Urban Meyer and Will Muschamp reached in these regards, but he is getting the program back there faster than his predecessor did. Mullen has been doing some other work beyond the headline numbers to restore UF’s recruiting infrastructure. He reestablished the pipeline to Lakeland in this cycle, and he already has several elite players committed in the 2020 and 2021 classes. One of the 2020 guys is from IMG Academy, a place that Florida has struggled to make any gains. 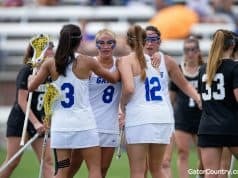 The IMG commit is not a blue chip, but any progress there is progress. Mullen also beat Nick Saban for Khris Bogle and Kirby Smart for Kaiir Elam, showing some impressive chops on the late signing day. So while Mullen is getting the program back up where it needs to be while focusing on the details, the next step is to end up with a balanced roster. I don’t just mean in numbers at each position but also age-wise from freshmen to seniors. It’s easy to give an example. Muschamp wasn’t particularly good at keeping the offensive line well stocked. Every coach has his own preferred numbers, but most programs like to sign three to five a year. Muschamp signed four total offensive linemen in his first two classes, one of which got in trouble off the field after redshirting a year and never played. To compensate, Muschamp signed five in his third class. Two ended up with medical disqualifications, a third quit football to play basketball, and a fourth was a JUCO who went pro after two seasons. Muschamp signed six in his final class, but two more had medical DQs and three others made no impact. Injuries are bad luck and ratings aren’t everything, but none of the guys who failed to pan out in those two classes were blue chip players. I don’t know whether Muschamp was taking some reaches just to add numbers, but it wouldn’t look any different if he had been. This is how you end up with a 2015 line with a converted defensive tackle, an FCS transfer, and a prize tackle recruit playing guard. McElwain took five more offensive linemen in 2015 but then five total across 2016-17. That created a veteran-heavy line unit last year, and so Mullen signed a whopping seven offensive linemen in this 2019 class. In fact, more than half of the 25 players signed are either offensive linemen or linebackers. The latter is a group that McElwain mismanaged about as badly as Muschamp did the OL group. Linebacker is a bit of a different story, though. Florida’s switch to a nominal 3-4 defense means it needs to sign more linebackers than it used to under a 4-3, although UF plays three linebackers on most snaps against most teams thanks to the base defense being nickel. Even so, the linebacker unit Mullen inherited (except for the Buck position, largely staffed by former DEs) was thin and vastly less talented than any Gator units in recent memory. Mullen may have addressed those positions of need, but he’s not been immune to imbalance himself. He admitted in his post-NSD presser that wide receiver and defensive tackle are two positions of extreme need in the 2020 class. UF signed just two receivers in the 2018 class, one of whom Mullen dismissed for domestic violence in the summer. 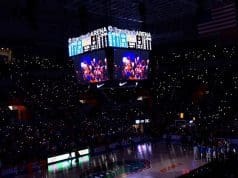 The Gators did add four in the 2019 class, but UF has four seniors and three juniors at the position. One of those juniors, Rick Wells, has done little in his career so far. The only sophomore at the position is Kyle Pitts, who played tight end last year and will essentially play like a tight end who doesn’t have to block. The 2020 receiving unit will consist of Trevon Grimes and Pitts outside, two slot guys in Kadarius Toney and Jacob Copeland, the 2019 signees (who aren’t likely to play much behind all the veterans), and any 2020 signees. That’s a lot of uncertainty beyond the top three or four, depending on whether Copeland can stay healthy and blossom as a player. The DT situation is more precarious. Mullen signed none in 2018 and only one in 2019. There are two seniors and three juniors there but only one underclassman in December signee Jaelin Humphries. 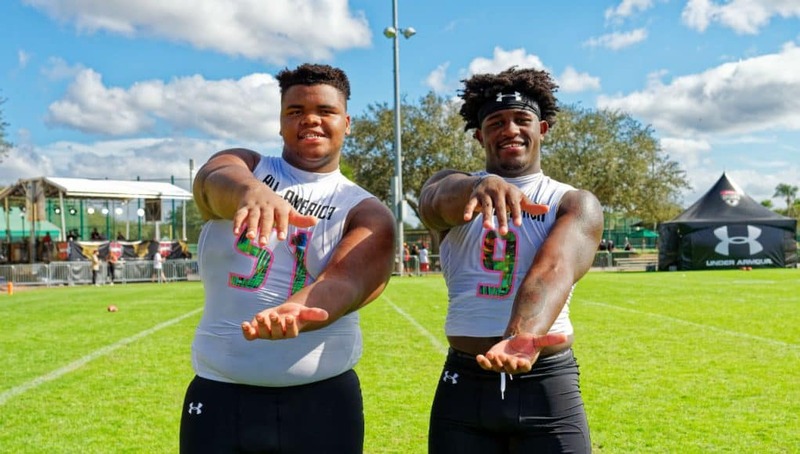 Should anything happen with Humphries, whether bad injury luck or off field issues or him just not panning out, Florida will have nothing in the middle of the defensive line between seniors and true freshmen in 2020. That’s not a place you want to be in the SEC. It’s possible to see another recruiting point of emphasis coming, too. UF has five juniors at safety with only two underclassmen behind them in Amari Burney and the younger David Reese. Therefore, players currently listed at wide receiver (Trent Whittemore), linebacker (Diwun Black), and/or running back (Iverson Clement) may end up back there by 2021 as much due to need of bodies as their potential to excel. The goal is to get to a place of consistency in numbers across classes: one quarterback per year, one running back, two or three receivers, three to five offensive linemen, etc. That’s never going to be possible indefinitely because of unplanned attrition, but even acknowledging that reality, you don’t want to be in a place where you’re having to go heavy on multiple positions a year like offensive line and linebacker in 2019 and wide receiver, defensive tackle, and maybe safety in 2020. Being forced to take a lot at one place in one year will at best set a roster time bomb for four years in the future at at worst will have a program load up on ineffective players. We saw that above with Muschamp and offensive linemen, and it happened at receiver too. He had to take a combined nine receivers in his final two classes to make up for not having enough in his first two, but among them only one (Demarcus Robinson) made a real impact. 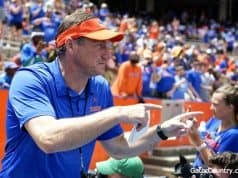 McElwain then had to take five in his 2016 class to compensate for Muschamp’s poor results, setting up the time bomb of an upperclassman-heavy unit in 2019 that Mullen is having to deal with in his 2019 and 2020 recruiting classes. This is not to say that Mullen’s dilemma at wideout was caused by Muschamp, because a thousand decisions about recruiting the position have been made by two staffs since then. Rather, it shows how a problem can reverberate across years and coaching regimes if not properly addressed. This is why one of Mullen’s top priorities moving forward is to come to a place of balance across positions and class levels throughout the roster.